Yep, the long awaited Mutant Crawl Classics Kickstarter is live! In less than 12 hrs it's nearly met it's $20k funding goal (it's at $19k) as I write this. So, what is Mutant Crawl Classics? Mutant Crawl Classics (MCC RPG) is a stand-alone setting that applies the DCC RPG rules to a post-apocalyptic setting. You'll love MCC if you like Gamma World, Metamorphosis Alpha, or DCC RPG. You don't need to own DCC to play MCC. I'm excited. 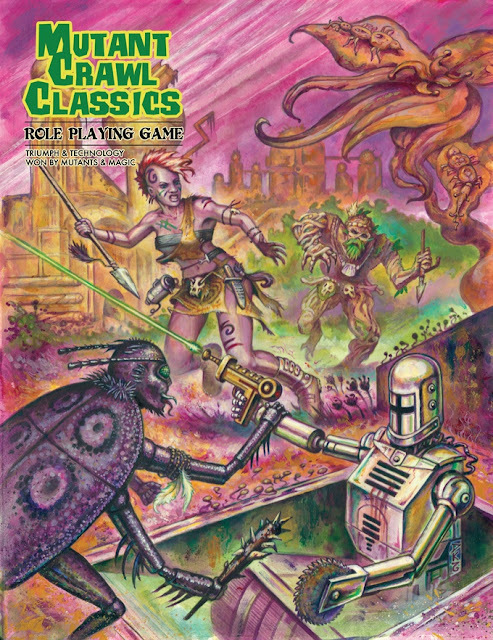 I enjoy the DCC RPG and my 2nd RPG (and the first paid for with my own money( was 1st Edition Gamma World. That, and +Jim Wampler writes some damn good DCC RPG material. Wisely, the stretch goals are in PDF and list 4 potential adventures. Goodman Games has been spot on with it's Kickstarter projects and I have no hesitation backing their latest. I know, man, but the compulsive completionist collector in me will be going nuts having that sit on the shelf alone. I s'pose I can always buy the modules and run them with Mutant Future. I've never done any postapocalyptic roleplaying, but I love DCC and this just looks like a lot of fun. Already backed. I'm so putting this next to my Mutant Epoch books (also old school and excellent). I helped with a MCC playtest last year and it was my 1st Crawl Classics game. I really enjoyed myself even thought my best funnel PC died pretty much in the 1st 5 minutes. He did go out in an awesome way. Felt more like Planet of the Apes than Fallout 3/4, but I could see using the system to play either with not a lot of tweaking. Great news! Been waiting on this! Backed at $100!